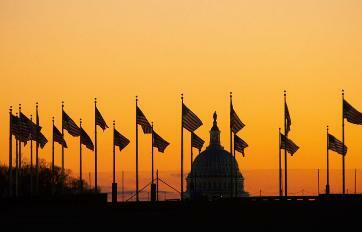 The sun rises behind the U.S. Capitol in Washington, D.C., January 2019.
flagrant to do so in recent history. foreign adversaries, and pledged to remove improper barriers to the ballot. take to address the abuses of President Trump and his allies and prevent them from recurring. The diverse class of newcomers to the U.S.
Below is a list of recent political scandals that H.R. 1 would help prevent from recurring, categorized by the legislation’s three main sections. This column may be updated as further relevant scandals are exposed. $670 million from the 2017 tax bill, which President Trump eagerly signed into law. their expenditures, place limits on aggregate contributions, and restrict donations from being used for purposes unrelated to the inauguration. filed against him. These complaints involved allegations that Kavanaugh misled the Senate about some of his job activities in the George W.
Bush White House, as well as alleged misstatements about details of a sexual assault that he was accused of committing in high school. the interests of a foreign entity, namely a pro-Russia Ukrainian party—and he took multiple steps to hide those earnings from the U.S. Cabinet secretaries have taken his cue. The most egregious violator of conflicts of interest rules may be Secretary of Commerce Wilbur Ross. in stock. In sworn testimony, Ross twice said that he divested himself of all inappropriate financial interests but later revealed he failed to do so.